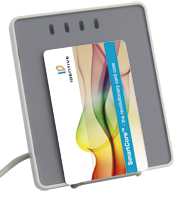 Identive Group Inc. announced CLOUD, its new smart card reader platform that that can be used with a variety of ID credentials, from traditional contact-based smart cards to near field communication-enabled mobile devices. Identive’s new CLOUD readers will be on display in the company’s booth 4K 051 during the 2012 CARTES Exhibition & Conference, taking place November 6 – 8 at the Paris-Nord Villepinte exhibition centre. Identive’s new CLOUD platform includes a range of readers for desktop, contactless, dual interface and integrated applications. 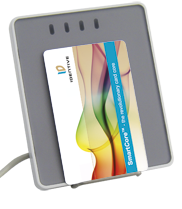 New NFC desktop and dual interface readers enable organizations to extend their traditional IT authentication environments beyond traditional contact and contactless smart cards to support NFC credentials in a range of form factors, from tags, key fobs and wristbands to smart phones. An optional secure access module on certain models provides secure storage and processing of sensitive ID information to enable authentication for logon and other access applications. CLOUD 4700 F Dual Interface Reader – Supporting ISO 7816 contact cards, 13.56MHz contactless technology and NFC, this PC-linked desktop dual interface reader supports end-user environments where both contact and contactless chip-based credentials are in use. CLOUD 4710 F Contactless readers – Supporting 13.56MHz contactless technology and NFC with a protected SAM socket, the CLOUD 4710 F enables two-factor authentication and additional security for contactless applications. Both the CLOUD 4700 F and the CLOUD 4710 F readers also are available as reader board products for integration into non-desktop applications such as kiosks or terminals. CLOUD 2700 F Contact Flash Reader – Supporting the industry’s latest generation of ISO17816 high-speed contact smart cards, The CLOUD 2700 F is designed for short transaction times for secure network logon, web/cloud-based applications and payment.